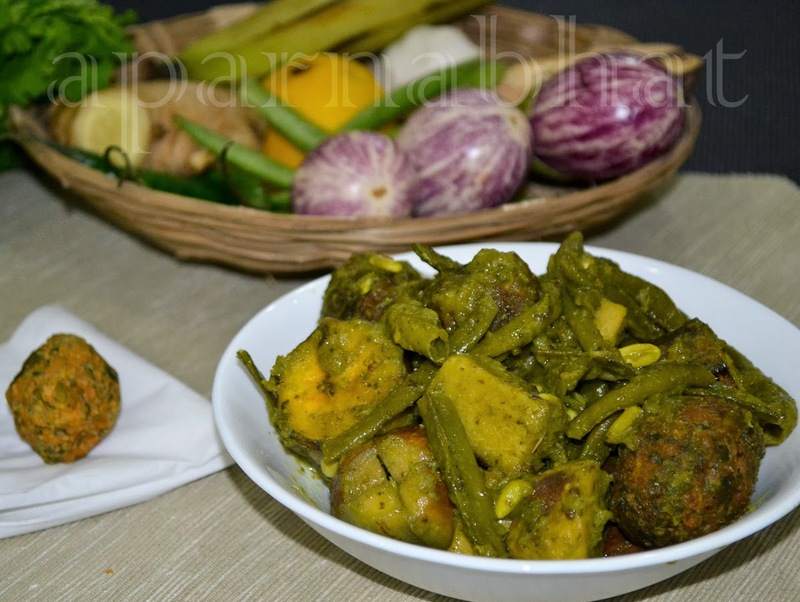 Undhiyo is one Gujarathi recipe that I never prepared at home. Whenever felt like eating ordered it from a nearby Gujarati restaurant, the reason being I used to feel its a time consuming preparation... One day, my friend Nutan Shenoy Kini of Nutan's Kitchen passed me her recipe for Surathi Undhiyo and I immediately thought of giving it a try... the inspiration being the recipe was written nicely with details. Everybody at home loved this dish and I am happy that I attempted it. Thanks Nutan akka for this wonderful recipe. Mix all the ingredients to make a stiff dough. Form into small oval dumplings. Heat 4 tbsp oil and fry ghattas for 2 minutes. Remove them from oil and keep is aside on a kitchen tissue paper. Use a heavy large sauce pan. Form a paste of chili, ginger, garlic and coriander. Rub the chunky veggies with oil and this masala paste. Marinate it for 30 minutes. Heat the oil that was used to fry ghattas and proceed. Add all the marinated chunky vegetables in this oil and stir well. Cover and cook for 4-5 minutes. Add papdi, turmeric powder, flour, carom seeds and salt. Cover and cook on low flame till the yam gets cooked. Add coriander, lemon juice and sprinkle some water if required. Add sugar and stir. Serve hot with parathas/rotis. good one Aparna....even I never tried this, always ordered from gujrathi lady..will try this for sure.